Our premier event of the year is our Pegasus Sprint at Castle Combe each October. 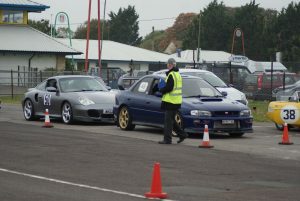 The event has been running at Castle Combe since 1991 and was the event which re-introduced sprinting to Castle Combe. The club worked with Castle Combe circuit to obtain the necessary additional planning permission which has enabled all current sprint events at the circuit to take place. Our event offers the opportunity to drive the whole circuit at competitive speeds including the challenge of Camp Corner – as well as this the event follows a traditional format with drivers getting two full practice runs as well as two timed runs. For over 25 years the event has always been over subscribed attracting drivers from all over the country as well local competitors. We are lucky to have the support of a number of one make championships which over the years have included Morgans, TVRs, MGs, Scimitars and Triumphs. To run the event takes around 70 volunteers and for those not competing it is an idea opportunity to get involved in running a motorsport meeting at a well know circuit. Most people start by marshalling which gives you the chance to get close to the on circuit action, with many progressing to other organisational roles, including secretarial, event control, paddock and clerk of course.